Over the last few decades Magnesium has become one of the most neglected minerals in human nutrition, being especially deficient in the modern western diet. Symptoms of insufficient Magnesium intake include chronic pain, poor sleep, tinnitus, facial tics, lowered metabolism, poor mood and muscle cramps. Fortunately, a Magnesium deficiency is easily solved. Let's talk about Magnesium for helping tinnitus. Tinnitus is the name given to persistent abnormal noises that do not originate outside your ear. Often described as a ringing or buzzing sound, tinnitus can often pass quickly. However, there are reports of rare cases lasting months and even years! While suffering from tinnitus, it may be difficult to pinpoint where the noise seems to come from. One of the most common causes of this aggravating inner ear condition is cell damage. Our inner ear is covered in microscopic hairs that move as sound waves enter the ear canal. The movement of these hairs trigger electrical impulses to your brain that are then interpreted as sound. When these delicate hairs become damaged or bent they can often leak impulses that are interpreted as sound by your brain. 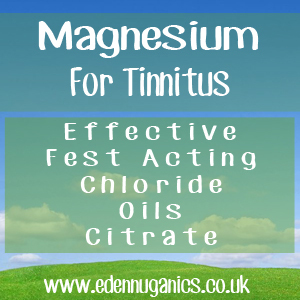 Over the years there have been a number of official studies proving Magnesium to be beneficial in the treatment of tinnitus. In 2001 the journal of occupational medicine stated that not only will exposure to loud noise increase your chances of developing this inner ear condition, but also simply being around such a noise can deplete your body's Magnesium reserves leaving you deficient in this key mineral. Another, more recent study concluded that Magnesium supplementation can dramatically reduce the likelihood of getting tinnitus or suffering hearing loss after noise trauma. What type of Magnesium should I use? Magnesium comes in many forms and it can be difficult to know what type is best to use for you and your family. The most easily absorbed forms of Magnesium are citrate and chloride, both of which can be bought at an affordable price from all good health food stores. In citrate form, Magnesium can be taken as an oral supplement with a recommended dose of between 400 to 100 mg a day for adults. Magnesium chloride has a transdermal action meaning it can be absorbed through the skin. This makes it great for adding to baths for relaxing soaks or mixing with water to form an oil like substance that can be applied directly to the skin. Kelp, shrimp, wheat bran, wheat germ, garlic, buckwheat, brazil nuts, millet, pecans, tofu, soy beans, brown rice, figs, dates, collard greens, cashews, avocado, parsley, beans, barley, dandelion greens and almonds. CoEnzyme Q10 (CoQ10) - in 2007 the journal of Otolaryngology reported that CoQ10 can be used as an effective treatment for some forms of tinnitus and other inner ear noises. Coenzyme Q10 works by generating energy in cell mitochondria which not only helps to reduce tinnitus but also help prevent heart attacks and strokes. Caffeine - Although there are no official studies backing up these claims, many people use coffee as a way to relieve tinnitus. The idea is that the caffeine found in coffee may help to reduce the flow of blood to the head, neck and ears, constricting capillaries and other small blood vessels.